Transparent Digital Signage - Projection Screens - Proscreen Inc.
Now you can control the most advanced digital signage interface from a single location. Our software solution allows you to create and control ads from a single PC to publish internally, externally or both. Publish fresh content to one or hundreds of displays across the store, region or the entire globe. 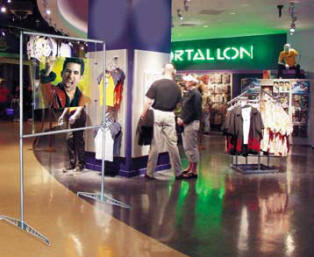 Utilize our show-stopping AIRSHOW by HoloProScreen for a significant “Wow Factor”. Add vivid images and excitement to your presentation with transparent rear projection leading edge technology. Magically, transparently, the AIRSHOW appears to materialize out of thin air! 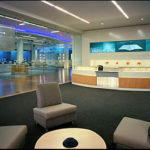 The HoloProScreen is a revolution in the art of display presentation. Free hanging and uniquely attention grabbing, it will add atmosphere and wonder to your presentations, exhibits or display areas. It is very mobile and a simple installation requiring only the HoloProScreen, a high lumens 3,000 to 4,000 single lens recommended NEC, LCD or DLP type projector with 30 degree keystone adjustment capability, and an image producing source such as a DVD, CD, or DSN systems with projector and presentation content data. This method is both cost and space efficient requiring no additional construction of enclosures or renovation to existing layouts. Allowing superfine resolution and high brightness across the viewing area, this phenomenally transparent screen is constructed of a photopolymer material applied to acrylic substrate to create a high tech rear projection screen that enables refracted light from the projector with a film pitch between 1/30th to 1/5th that of a human hair! The precise configuration of the screen polarizes and refracts incident light falling on all areas of the screen to insure sharp bright images with great uniformity emerging from the front and rejecting all other ambient light. Projection angle at the screen center is 35 degrees from the horizontal surface. The projector and AIRSHOW rear projection screen can be either ceiling mounted or floor mounted with the system. Use your air space to generate revenue with the AIRSHOW. Vendors pay for extra ad space. Along with square footage floor revenue, use the air space above your floor to compound your return. Update content centrally or locally React quickly to competitive price changes and merchandising feature changes. 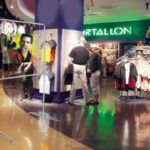 There is no limit to the benefits and applications in all in-store display configurations, including exposition-convention centers, hotels, cruise ships, amusement parks, shopping malls, theaters, lobbies for trailers, fashion shows, trade shows, displays, museums and virtually any place to attract, inform and entertain your customers. 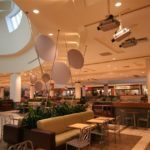 Almost completely unaffected by surrounding light, the HoloProScreen can be employed in daylight and produces an image of high contrast and brightness with brilliant quality. 1. The Holo ProScreen is a lighter weight display that produces larger life-like images without the bulkiness of the current media-producing monitors. 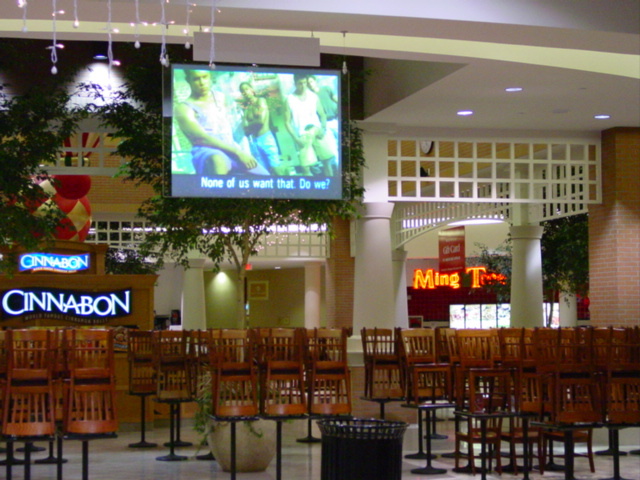 This free hanging installation is less intrusive with space saving advantages over conventional video type displays. 2. This totally transparent display adds to and does not detract from the display area. This screen will fill with a holographic AIRSHOW vivid eye catching images when activated and allows unobstructed see-through visibility of the display area when deactivated. 3. The complete system (projector, data source and HoloProScreen) is a simple economical display that can provide advertising in various continuity modes that will attract and draw people to the promotional area. 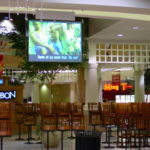 All it takes to change the promotion or product service presentation is to change the programmable DVD, CD or Digital Network Signage System Processor rather that continually replacing one-dimensional graphic signs. 4. Revenue generating opportunities can be realize by renting advertising time to clients or vendors. Seeing innovative new products, for Oscar de la Renta to NIKE jump out of thin air on a HoloProScreen would be a sensational way to introduce new fashions, cosmetics, automobiles, cellular phones, art, computers, general information directories, maps, schedules, you name it—the list is endless. The thing most cruise ship patrons ask is “What is going on with the HoloProScreen Air Show System?” The patrons can hardly keep their eyes off the information or highlights of events. 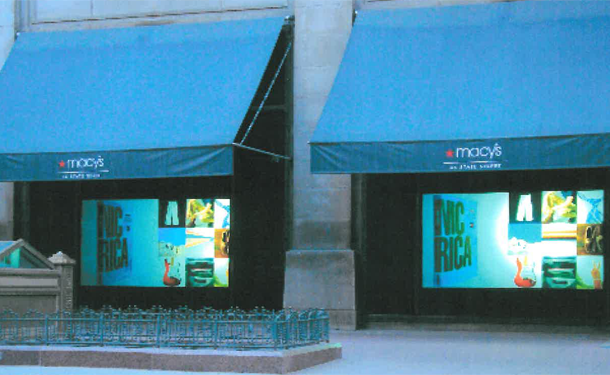 The HoloProScreen can also be applied directly on a window display by our trained technician. When a presentation is displayed, the HoloProScreen produces a vivid holographic picture. Otherwise, the HoloProScreen is transparent and the view from the inside is always clear. 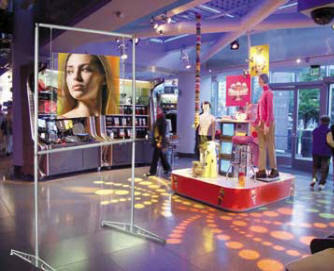 When the projector is off, the outside observer has a clear view of the exhibits inside the store or display. 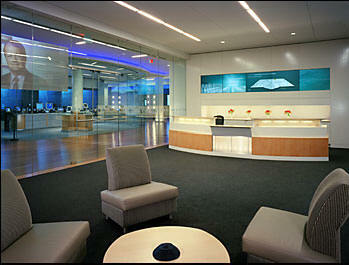 HoloProScreen outperforms flat plasma screens in various applications. 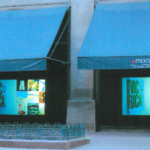 Window displays, retail stores, P.O.S. 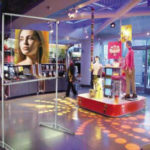 Retail store window, free hanging visual imaging in key aisles, point-of-sale displays, exhibitions, airports, and museums. These are but a few of the display applications the new AIRSHOW by HoloProScreen allows you to design with optimum use of space. The AIRSHOW by HoloProScreen includes an advanced transparent holographic film that captures and displays images rear projected from exactly 35 degrees. All other light is ignored. The result is remarkably bright clear images without use of cabinets. And since the holographic film does not reflect sunlight, the HoloProScreen can be viewed clearly in high light environments and even outdoors. 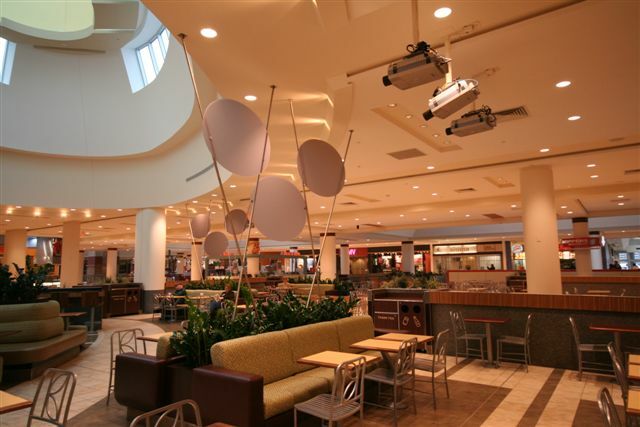 ProScreen offers projectors, assembly and installation of the complete systems working with production houses, display companies, advertising agencies and media solutions integrators. The transparent film allows viewers to look at and see through the screen. Only the parts of the projected image that includes images, text and color can be seen. The rest of the screen remains transparent. This characteristic is especially useful in shops and displays as the installation has little effect on the internal layout and design. Regular LCD, 1800-3200 lumen projectors with keystone adjustment required. Click here for an installation guide.